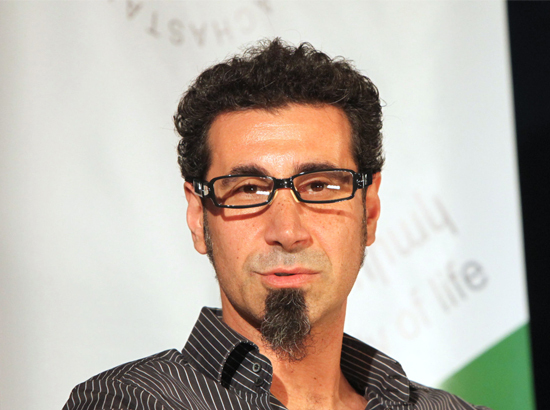 Grammy-winning singer/song writer Serj Tankian has sent an open letter to Serzh Sarkissian, expressing doubts that the incumbent president has indeed won in February 18th Presidential elections and calling for the de facto Armenian leader to institute genuine rule of law in the country, punish those, who stole the vote from the people, dissolve the parliament, ensure that genuinely free and fair elections are held and that the government is truly representational. Find the full letter below. This entry was posted in Armenia, Politics and tagged Armenia, Armenian, Election, President of Armenia, serj tankian, Serzh Sargsyan by Observer. Bookmark the permalink. Yes, Serj, but we are not sure Raffi has won too. I would gladly revote. Also, please come and vote in Armenia’s elections next time around. That would be a better contribution to democracy and justice. Just a little reminder: Citizens of Republic of Armenia who were abroad on the election day were not able to vote. Why? Why? Because of a very bad law. My younger grandson is also our namesake. He is too young to know that he was born to descend a proud nation, small, overburdened with issues but still a citizen of a victorious and forward-looking country. He still has a lot to learn. Serj, you and me, all of us, shall report to him and his generation on what we have done, on what kind of a new homeland under Holy Mountain we convey them. Can you imagine questioning eyes of those to whom we shall report? You and me, Serj, all of us. Those eyes are childish and playful but tomorrow they are going to be serious and investigating. That is not our path. We are comrades on the matter of the path we embark upon. Indeed, it is time for change. Nobody can be above the law. Falsification and hypocrisy, impudence and hostility will destroy drop by drop and steadily our ability to cry wholeheartedly: “Freedom, we are free”. We need to do that in order to call upon all: “Back To the River Aras!” We need to do that, Serj, in order to embolden ourselves to look into the eyes and respond to the questions of little Serzh and of their generation. For that exact matter I do need your assistance, and assistance of all of us be they from Glendale or Stepanakert, from Melbourne or Moscow. I believe in our collective victory. And in conclusion I will address your question. You asked me if I was really sure, deep inside, whether I was the true chosen leader of our people or not. I respond to it that I have always been sure in whatever I have done be that battle command or organization of elections. One needs to feel Armenia, Serj, and it is not possible to feel it siting in an expensive office in downtown Yerevan, even if one sits there for too long. Armenia can be felt standing on the rocky land of a hamlet that struggles to continue its eternal path. Armenia can be felt of the green of flowers planted at a cemetery of our freedom fighters. Armenia spoke up, Serj, believe me. That is all I wanted to tell you. Please convey my best regards to your father, and let the proud message of the spring stork prevent us from choosing a wrong path. Incredible, thank you Serj for simply stating the truth. Yerevan/Mediamax/. The correspondence between rock musician, System of a Down frontman Serj Tankian and Armenian President Serzh Sargsyan is going on. It should be recalled that Serj Tankian sent a letter to the Armenian president yesterday. Yesterday, the Armenian President sent a response. I think you have done a great job at securing Armenia’s bordersand dealing with the extremely sensitive and difficult situation presented by the realities after the Karabakh war. That said, security cannot be the scapegoat to diffuse attention from the inequities and injustices in our homeland. Republicans in the U.S. have done that for too many elections and no one seems to buy it anymore. I, too, feel responsible to future generations for what we leave behind. That is the reason for my speaking out, getting involved with mining and environmental abuse in Armenia (Teghut) and encouraging further farm subsidies to render our nation more self sufficient. Citizens across Armenia are protesting the outcome of the elections and the injustice inherent in the political establishment. Please listen to their complaints. Listen to the striking students and don’t let the schools or police shut out their voices from our democracy. They are the future of Armenia after all. Corruption, injustice, emigration, lawlessness and falsified elections. These ills have emptied our country of its citizens more than mines and bombs. Are you going to reform the system? Dear Mr. President, please institute the rule of law once and for all so that people feel respected in the eyes of the law and the courts. The constitution and the laws of Armenia are fine. It is their execution that is lacking. We are all tired of hearing about investors turned away, robbed of their investments in Armenia, political pressure used for personal gain, media manipulation and consolidation for political means, injustice in the courts, and on and on. Most people feel that it will take a generational change to alter the political culture in Armenia, to rid ourselves of the overt corruption and abuse. You can make that happen now! In your letter you have recognized the need for that change and seem to suggest that you are willing to take substantive steps in that regard so that we don’t have to wait another 20 years for us to arrive to true freedom. For that, your people will be eternally grateful Serzh. An equitable nation is a strong nation, where people are not only proud of their history, but also proud of their present. I agree that we should all work together toward a better future for Armenia. I appreciate the warm wishes to my father. I too, send my regards and love to your family and hope to meet your grandson Serj sometime.